Tara Strand and Harriet Palmer, New Zealand Tree Grower August 2018. Most small-scale forest owners spend a good deal of time keeping their fingers crossed that their trees will survive to harvest age. While crossing fingers is about all that can be done to ward off earthquakes and tropical cyclones, it is a different story when it comes to minimising the effect of damaging new pest and diseases arriving from overseas. Harvest levy funds are helping to develop new methods for pest and disease surveillance and control in urban areas which are critical if unwanted new arrivals are to be caught early. 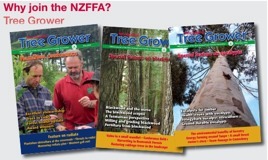 New Zealand’s forest owners rely mainly on national biosecurity systems to reduce the risk of new pests and diseases becoming established. The best case includes effective surveillance around potential pest and diseases entry points, rapid early detection of new incursions and then control and eradication. The most likely entry points for new pests are airports and ports, which are almost always found in, or close to, urban areas. The more quickly and effectively new pests can be identified and controlled in these areas, the lower the risk to all forest owners of a large-scale or out-of-control problem. However, working in urban environments brings some challenges. Scion is part of an international team, which, with the help of Forest Growers Levy Trust funding, has been developing methods for the pest surveillance and control in urban areas. Their Urban Battlefield research programme is wide-ranging, and includes projects to improve surveillance, develop low-impact eradication technology, and work with urban communities to develop socially acceptable pest control protocols. To improve the accuracy of aerial spraying and using sophisticated monitoring equipment, researchers have gathered data on air temperature, wind velocity and turbulence around forest canopies. They have found that the effect of canopy turbulence on reducing drift is far greater than was known before, and also than is accounted for in existing spray drift models. These models are used during pest eradication programmes to account for the quantity of active pesticide deposited in the target area and to determine potential off-target drift. Spray drift models are now being updated, enabling better predictions of spray deposition and drift, and of how spray droplets penetrate forest canopies. In particular, AGDISP will be modified. This is an internationally used aerial spray model developed by the US Forest Service, and used in New Zealand by forest managers during conventional spraying operations and during pest eradication programmes. In turn, researchers are gaining a better understanding of the way that sprays behave in other complex environments such as urban areas and around sea ports, which again will increase the accuracy and efficacy of spray applications. Linked to this, they have been working on ways to spray individual trees accurately. The benefits of this in urban areas are obvious. Unpopular blanket spraying can be avoided, but individual trees or small areas harbouring pests, once identified, can be efficiently dealt with. Until recently, targeted spraying has been very difficult and dangerous and was achieved by people leaning out of helicopters with spray lances which douse the trees, or by helicopters with just one or two nozzles on the boom open and the pilot attempting to see the target. Aerial access in urban areas is always problematic, given the prevalence of overhead wires and tall buildings or other structures. Helicopter downwash is another problem when the helicopter gets too close to the trees it is attempting to spray, predictably reducing the accuracy of the spray application. The biggest advance in targeted spraying has been the development of tethered ring-boom technology. Scion has been working with Rotorua-based helicopter company HeliResources, who have developed a boom which hangs well below the helicopter, with spray pumped from a tank held under the helicopter. Using this, spray can be directed right into the target tree’s canopy. The tether is adjustable allowing highly targeted or wider targets. Trials have looked at different lengths of tether, droplet sizes, and understanding the effect of helicopter downwash on spray deposition and drift. The technology is already being used in wildlings control. Current challenges include adapting the spray gear to fit any helicopter. This method is ideal for the urban environment where Civil Aviation Authority rules require helicopters to fly above a certain height. The tether and ring boom allow the helicopter to meet CAA rules while targeting spray. Scion and HeliResources have worked with CAA as a part of this project to gain approval for the ring boom system. This method is ready for use during an eradication programme should MPI need aerial spraying. UAVs – unmanned aerial vehicles or drones – are becoming ubiquitous in forest management, with applications relevant to many aspects of planning, growing and harvesting trees. Advances in UAV- mounted technology for pest detection and control are all part of this trend. UAVs have the big advantage over other aerial options of being able to operate in specifically targeted areas and relatively limited spaces. The Japanese have used UAVs for some years to spray their agricultural fields, but their use for forest spraying is relatively unusual. Being able to use a drone to mark a specific tree with pesticide is a major potential advantage, as is use near a sensitive boundary or in confined urban spaces such as parks and gardens. Using UAVs to detect pests is one of the most novel developments of the urban battlefield programme. Scion has been working with French counterparts Centre National de la Recherche Scientifique and Institute of Ecology and Environmental Sciences to develop and test a UAV fitted with a pheromone sensor. This uses antennae to pick up signals in the form of odours from target pests, identifying their location. The system is now at proof-of-concept stage, and beyond this, work is continuing to expand this capability by testing it in North America with different insect species not found in New Zealand and not wanted here. The urban battlefield research programme is drawing to a close, but applications for a new round of funding are already in the pipeline. Taking the UAV-mounted sensor to a new level is one of the themes in the proposed programme. By bringing in collaborators from around New Zealand and overseas, Scion hopes to develop the technology and extend the science for UAV-mounted sensors to detect plant diseases before the symptoms occur. Currently plant disease is detected after the symptoms appear, by which time the disease has often travelled far and wide. Using UAV-mounted sensors to search for pathogen spores and chemicals emitted by stressed plants is a way to determine if the disease is present before the symptoms appearing. This type of surveillance will probably reduce the total area affected by the disease because early detection often equals less spread and therefore increase the likelihood for eradication. 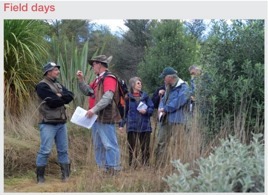 The technical advances which have been made in terms of surveillance and early detection, and improved spray targeting, are significant and beneficial to all New Zealand forest owners, including small-scale owners. Benefits will increase as research continues. In particular, developments using UAVs still have a long way to go. The bigger rewards from this programme include the probable gains in terms of forestry’s image in the eyes of the urban public. The new technology will mean reduced disruption to people living close to sites of pest and disease infestation. In addition, researchers have been busy developing new methods of improving liaison with local communities to explain the how and why of biosecurity activities which may happen in their backyard, and to involve them as much as possible in developing protocols. Dr Tara Strand leads the Urban Battlefield research programme at Scion. Harriet Palmer is an independent forestry communications specialist.